The loudest sound in the known universe is that of a “click” when your gun is supposed to fire. We’ll refer to that sound as a malfunction. Sometimes there’s not even a click and the gun still won’t fire. We’ll call that a malfunction too. 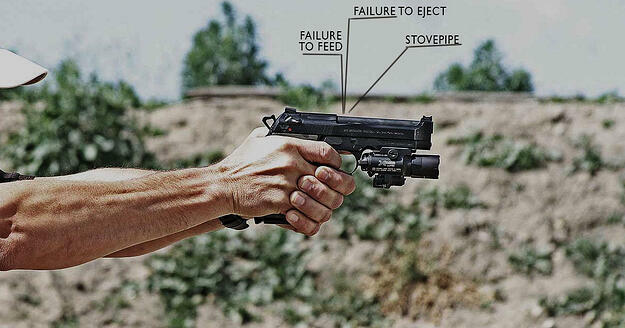 Fortunately, unless something physically broke on your gun between shots, malfunctions fall into a couple of common categories. Let’s take a look at how to deal with them. If you’re at a retail or club shooting range, odds are pretty good that a Range Safety Officer is nearby. In that case, never hesitate to ask for help if you are not confident in what you’re doing. Range Safety Officers deal with questions and malfunctions about a thousand times a day and will be able to help you out. Just put your gun down on the counter, muzzle facing down range, and seek assistance. Whatever you do, don’t turn around with the gun in your hand and yell “Hey!” That will cause a ruckus for sure. A semi-automatic pistol is a nifty invention. The “auto” part of semi-automatic refers to the fact that the gun is designed to automatically eject a spent cartridge casing and load a new one after each shot. Sometimes, things go wrong and the cartridge scheduled for forcible ejection doesn’t want to leave. It’s the same principle as those relatives from Ohahumpa, Florida who visit at Thanksgiving. More often than not, a failure to eject is caused by the shooter. Semi-automatic pistols rely on the shooter holding the frame of the gun still during ejection so that the slide and springs have something to work against. If you use a weak grip, the gun moves backward with the slide and that whole bit of fancy recoil mechanism engineering fails. This may cause an empty cartridge case to get stuck in the ejection port. This blocks a new cartridge from being loaded and prevents the slide from closing fully. All this is a long way of saying the gun don’t shoot no more. Sometimes, the failure to eject or feed malfunction is caused by a magazine not being fully inserted into the gun. It may stay in place, but not be fully engaged. 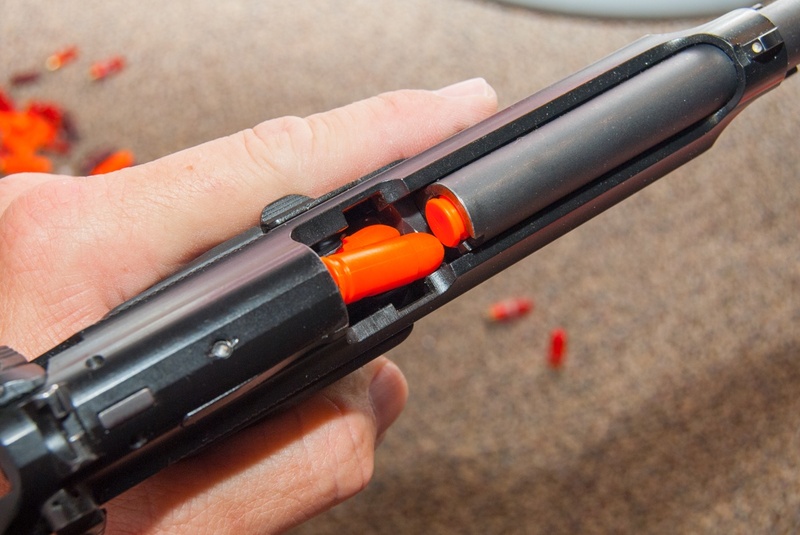 As a result, the cartridges in the magazine aren’t lined up with the chamber properly and won’t feed reliably. Guns aren’t pansy toys, they’re meant to be operated with vigor. So whenever you insert a new magazine into a semi-automatic pistol, smack it in there like you mean it. Whatever the cause, to make the gun work again, you have to get rid of the spent cartridge casing and allow the slide to grab a fresh cartridge from the magazine and load it in the chamber. Keeping the gun pointed safely down range, enthusiastically smack the bottom of the magazine to make sure it’s seated properly in place. That’s the “tap” part. Smack is probably a more descriptive term as you don’t want to be gentle. The goal is to make sure that the magazine is firmly seated in place. Rotate your pistol a bit to the right so the ejection port is facing towards the ground. Gravity helps here and most pistols have the ejection port on the right side, hence the suggested rotation to the right. Now rack the slide vigorously ONCE. This will (hopefully) clear any spent cartridge casings stuck in the ejection port and load a new round in the chamber. If you rack the slide more than once, you might be flinging perfectly good ammo from the magazine onto the floor each time you rack. Here’s the “bang” part. But we prefer “reassess” - because you may not always want or need to shoot. Do things look normal again? Is the slide fully closed and in battery? “In battery” is one of those fancy gun terms that means “fully-closed” by the way. The next most likely malfunction scenario is a beasty one. It’s called a double-feed. And it’s double trouble because you have to do some rhythmic gymnastics to clear it. The first step assumes you’ve already done the Tap, Rack, Bang/Reassess drill with no success. Using the slide lock on your pistol, lock the slide to the rear, again keeping the muzzle pointed down range. Remove the magazine. If you do have a double-feed, you’re going to have to exert some serious force to remove the magazine. Don’t be afraid to use some muscle. Save the magazine. You can tuck it under your shooting hand arm, stuff it in a pocket, or if you have the coordination of a mature spider monkey, hold it between a couple of fingers. You may need this magazine when the jam is cleared, especially if it’s the only one you have! Now rack the slide several times vigorously. There is no magazine in place so you don’t have to worry about flinging perfectly good ammo all over. You’re trying to clear out anything in the chamber area that might be jamming your gun. Now replace the magazine and smack it into place. Rack the slide one more time to chamber a round. Unless your gun malfunctioned for some other reason, you should be good to go. If these methods don’t clear the problem, then there is more going on that we can’t address in the scope of the book. Try getting help from the Range Officer! Remember, if ever in doubt, ask for help!